While speaking and guiding at The Great Salt Lake Bird Festival in May, the kind folks at the festival put me up in Bountiful, Utah. The hotel was lovely, but being between two busy highways it was not so birdy. 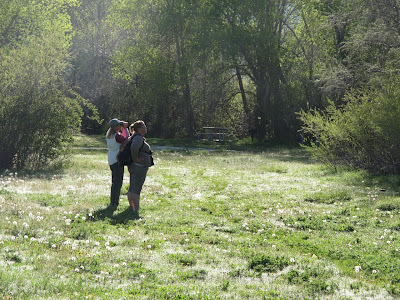 When I found myself with a free morning, I was determined to find some birds to enjoy and to photograph, so I enlisted my new friend Valerie a festival volunteer and local Utah birder, to help me find a good, birdy spot. 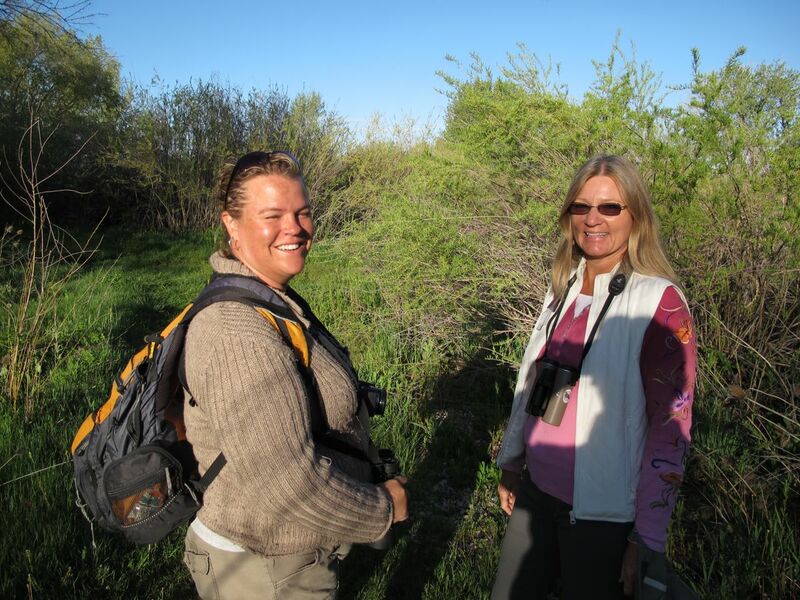 Also joining us was a longtime friend, birder, and Rio Grande Valley Birding Festival raconteur Marci Fuller. Marci was seeking a Virginia's warbler. I was seeking some bird photo opps. Valerie was kind enough to take us to a real gem of a spot called Willard Bay State Park, north of Salt Lake City and Bountiful. It turned out to be a bountiful trip! As soon as we got out of the car our ears were assaulted by bird song. 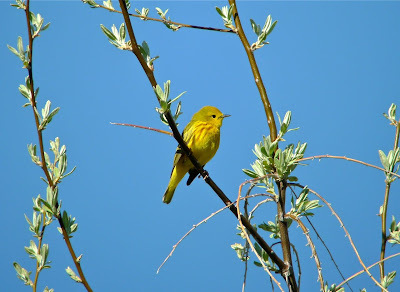 Yellow warblers were singing from every direction. 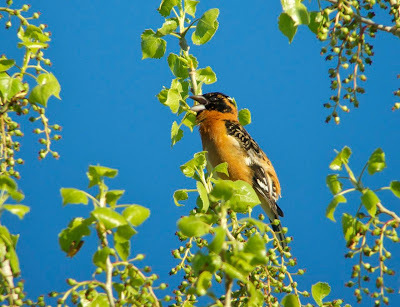 Lazuli buntings and black-headed grosbeaks vocalized from the cottonwoods, and a host of other noisemakers chimed in. And then I heard one of those calls that you KNOW you know, but you can't quite place it. Know what I mean? This happens to me every spring. Cavorting along the branches of a tree with lots of apparently tasty buds was the calling bird and, when I saw what it was, I jumped up and down, squealing, like a six-year old girl who's just been given a pony! "Hey! 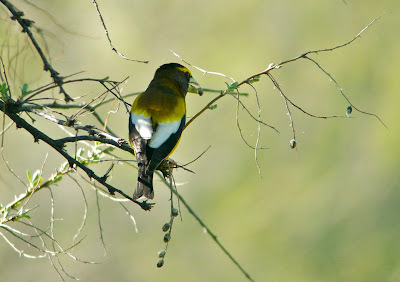 EVENING GROSBEAK! Yes! Holy #@$%&*#$%! I KNEW I knew that call! How OSSUM is THAT BIRD!" Then (I hope not because of my antics) the flock flew far away and I had to wait for a couple of hours before we relocated a photograph-able bird (below). I love evening grosbeaks, in case you were wondering. The first year of publishing Bird Watcher's Digest in our home in Marietta, Ohio, we had a huge finch invasion with loads of evening grosbeaks at the feeders, so they've always occupied a special place in my heart. Valerie lead us along the park's paths, many of which were flooded, necessitating some detours. We picked carefully through flocks of still-migrating warblers hoping to find a Virginia's, but we dipped out. Lots of orange-crowneds and clouds of yellow warblers, though. Another song caught my ear—familiar, but not as familiar as the grosbeak's. 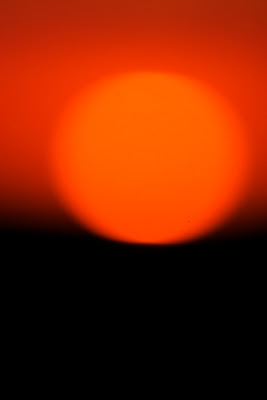 It was a dark-plumaged fox sparrow singing a slightly weird song. We listened to his amazing melodic phrases. 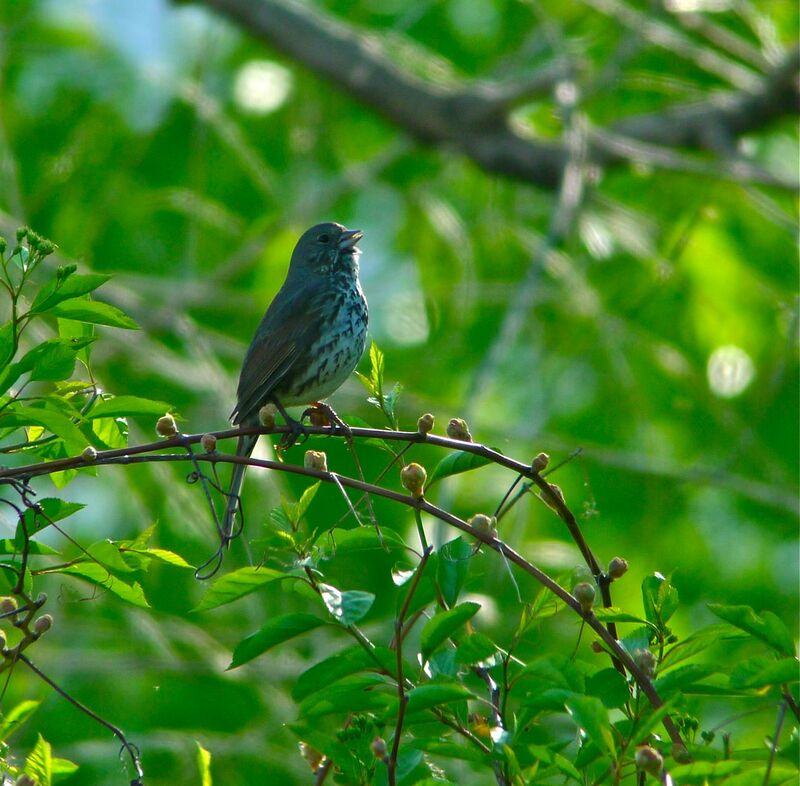 Fox sparrows pass through my home turf in spring and fall, only occasionally stopping long enough to be heard singing. In my opinion they are an underrated singer. Valerie and Marci scanning the woodland edge. Farther along the path, winding in and out of the campground, we came to the edge of the lake and scooped up a nice variety of species new for the day's list. 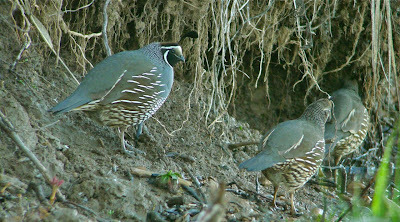 A male California quail and his covey of purty ladies skedaddled along the shoreline and into deep cover—though not before I got a few photos. 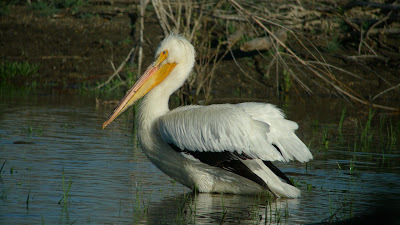 Several American white pelicans were soaking up the warm morning sunshine in a small embayment. They hardly paid any attention to us. Out on the lake a Clark's grebe drifted in toward shore and I digiscoped it. 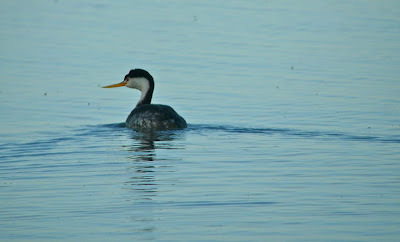 This species seemed to be present here in Utah in equal numbers to its near-lookalike, the western grebe. Little did I know then, but I'd be straining my eyes to find a Clark's on a Big Day adventure in North Dakota just three weeks later. In ND, it seems to be 50 westerns for every single Clark's grebe. [Yes, we finally got a Clark's in ND!]. 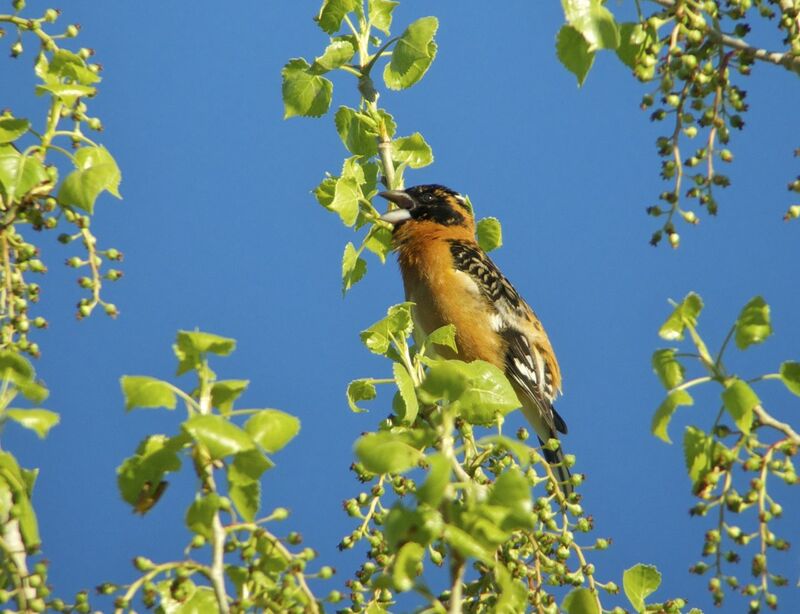 A very cooperative male black-headed grosbeak sang for us in the sun. Seeing this stunning bird so well through my scope reminded me that we can get blasé about our familiar local birds. I recall wondering about a European friend's overwhelming joy at seeing a northern cardinal on my farm in Ohio. There are no all-red birds in Europe, so seeing one for the first time made his eyes pop out. I felt that way about this black-headed grosbeak—so handsome, especially to my eastern eyes. It's funny how easily we may overlook common birds. A pair of American robins was building a nest in the interpretive signage near our parking lot. They seemed wary, as if not wanting to tip us off to the nest's location. Since I began dabbling in various forms of bird photography, I think I've paid a bit more attention to common birds, especially if they are being cooperative enough to photograph. Valerie (left) and Marci laughing at my evening grosbeak happy dance. It was a fine morning of birding at Willard Bay State Park, thanks to Valerie. Too bad we missed the Virginia's warbler. That one'll have to wait until next time! For my readers who are interested in experiencing some excellent birding in the western United States, I highly recommend the Great Salt Lake Bird Festival as a fantastic starting point. The festival organizers really go all out to make everyone feel welcome, the birds are great, the birding hotspots convenient, and there's a lot offered for young birders, too. Check it out! 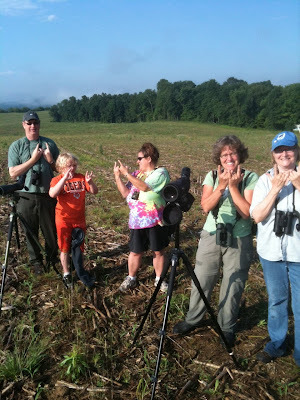 We get a lot of telephone calls about birds at Bird Watcher's Digest, as you might expect. People call in with all kinds of questions (I found a baby bird, what do I DO? There's a weird bird at my feeder! What is it? 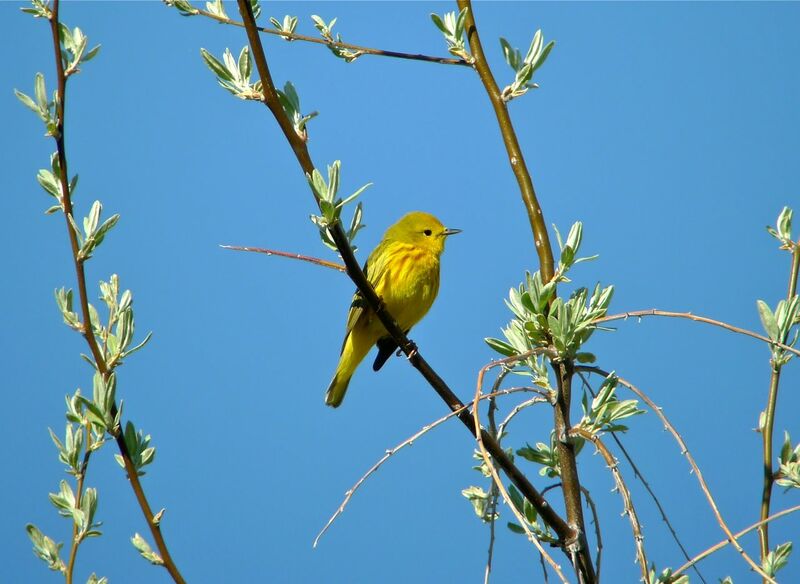 How do I attract more Kirtland's warblers to my bird feeder? What are the Baltimore Orioles going to do about their horrible relief pitching?). And we get lots of calls with bird sightings. Some of these calls are about birds returning in spring (hummingbirds, for example) or arriving in fall (juncos). 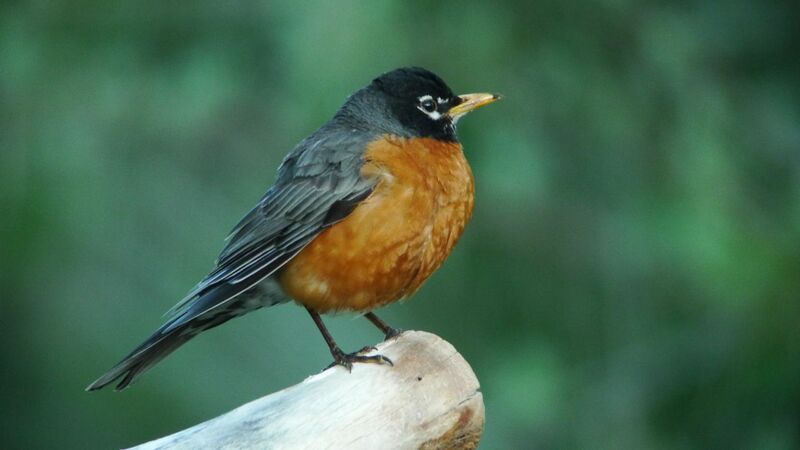 In fact for years I got an annual call from a woman up the Ohio River to let me know she'd seen "the first robin of spring." This seemed to give her such satisfaction that I did not have the heart to tell her that American robins often spend the entire winter here in southeastern Ohio. Every so often we get a call about a strange bird and it turns out to be an awesome sighting. Back in the early 1990s we got a call from a non-birding acquaintance who had seen "a large white pelican-like bird" up at Newell's Run. Sure enough, she'd found Washington County's first-ever (or at least the first-ever recorded) American white pelican. We've gotten calls about rufous hummingbirds, peregrine falcons, tundra swans, black terns, bald eagles, and even earlier this spring—a Bullock's oriole. Some of these sightings are more unusual than others and for some odd cosmic/karmic reason a lot of them come in when I'm away on a trip. I've never been much of a rarity chaser—oh there were a few years when I lived in new York City when my friends Bob, David, Starr, and I chased quite a few vagrants around the East. But we missed a lot of them and I kind of lost my taste for the chase. Now that I own some land of my own (80 wooded acres in southeastern Ohio) the list I most love to add a bird to is our property list (currently hovering somewhere around 186 species). Still there are some sightings that you've just GOT to check out. This was the case yesterday when the phone rang and a longtime Washington County resident told my mom that she had a weird bird that was hugely tall and she was "pretty sure it wasn't a great blue heron." My mom talked her through a few possibilities and they came to the conclusion that it was probably a sandhill crane. My mom told me about this bird about 4 pm and handed me the directions to the farm field where the bird had been seen. Daughter Phoebe was working with me at the office and I was entangled in a few projects, so we could not break away until 6:15 pm to go after the bird. At 6:15 pm yesterday, as we were leaving the BWD offices, a big thunderstorm was arriving. We found the farm, picked up Donna, the woman who reported the bird, and went looking. Rain, rising mist, and imminent nightfall all conspired to keep the bird from our view for about 45 minutes as we drove along a cart path through a neighbor's corn and barley field. No joy. We turned around and started back toward the main road. Donna and the neighboring farmer had seen the bird that same day and the day before, so I had a hunch it might still be around. As we drove back out the path, I stopped the van and told Donna and Phoebe that I wanted to climb to a high point in the field to scan the one section we'd been unable to see from the path. I did this and scanned, finding nothing. 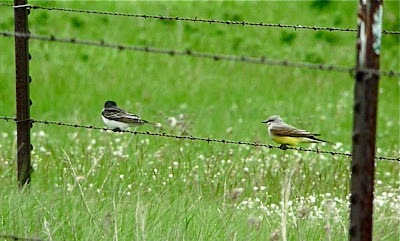 As I turned to go, two small birds flew up from an adjacent field that was contour planted in alfalfa. 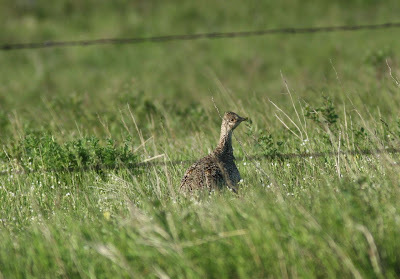 They turned out to be eastern meadowlarks, but as I followed their flight path with my (crummy) office binocs, a large gray and rust bird came into view! 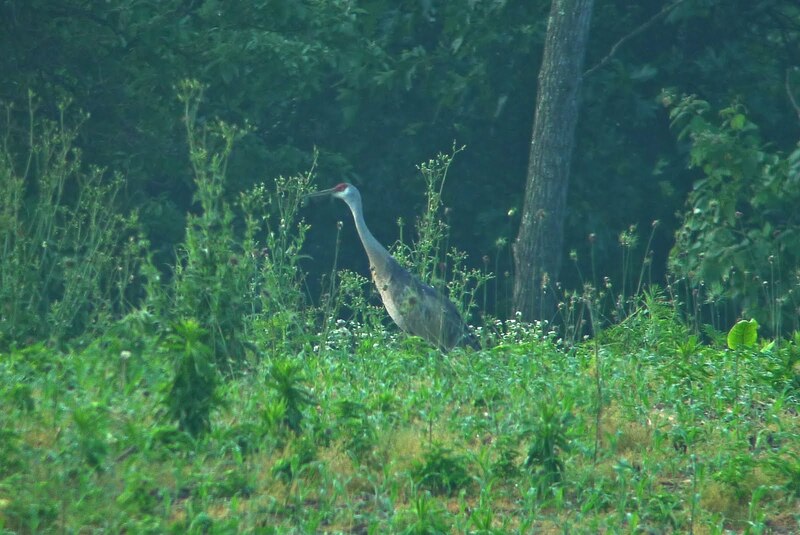 SANDHILL CRANE! My first-ever sandhill in Ohio! I looked back down the hill and gave the gals the thumbs up. The crane was feeding and preening leisurely. And then it called once, which gave me goose flesh! Such a wild-sounding bird! Sandhill cranes have bred in northwestern Ohio in one or two places for a few years. And they migrate over Ohio in spring and fall, though I believe their path takes them farther to the west than our corner of the Buckeye State. 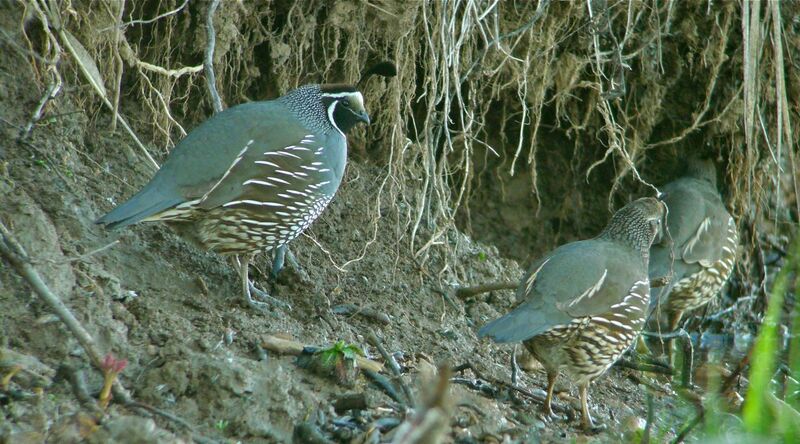 I've dreamed of adding this species to our farm property list, and as the eastern population (nesting in Michigan and to the north and west) expands, perhaps my chances at this are increasing. Having spotted the lone sandhill, I knew I needed to spread the word among my birding pals. It was too late in the day to get them out immediately, so we made plans to return early today (Friday, June 17). Steve, Shila, Cheryl, Sage, Julie, and I met at the Berg Church in the dewy sunshine and started scanning. We drove back to the spot I'd seen the bird last night and walked up the hill. Halfway along, Julie blurted "It's calling! I can hear it!" Sure enough, just as we crested the hill, Steve spotted the crane foraging in a strip of still-standing barley. Not a single one of us had grabbed our cameras as we got out of the vehicles! Major bummer! 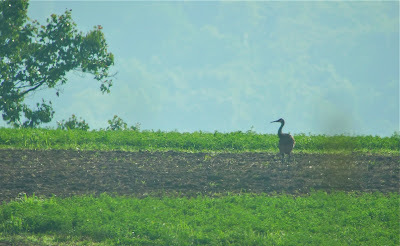 The sandhill noticed us and walked off, then flew slowly, calling, to the far end of the complex of fields. We relocated ourselves and then re-located the bird and were able to get long, satisfying looks. 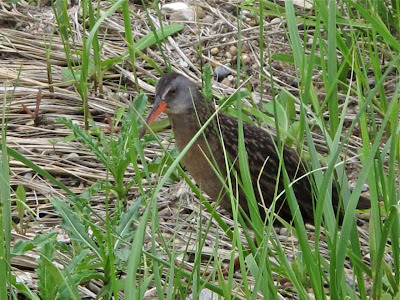 We watched the crane, making notes about its red crown, its rusty gray body feathers, its apparent lack of leg bands. It seemed perfectly healthy, which was good. Members of the Whipple Bird Club flash the club's hand sign to celebrate the sandhill crane sighting. Since it was a life bird for a few of our group, we celebrated with a Life Bird Wiggle. 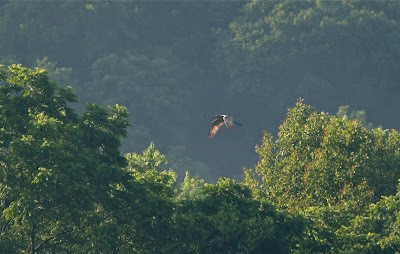 This was an amazing bird to see in southeastern Ohio in mid-June. And all thanks to a phone call from a kind, curious acquaintance. Thanks Donna! 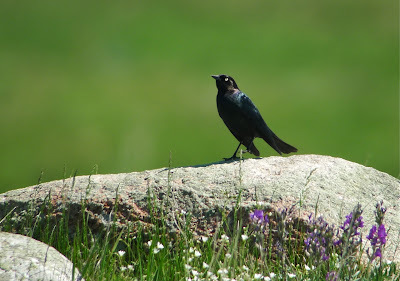 My nominee for North America's Most Beautiful Blackbird is the Brewer's blackbird. Check out the iridescence on this dude I photographed on territory in North Dakota recently. He's got that "look" in his pale eye that the ladies can't resist. Just enough of a bill to be taken seriously. Drooping his wings to show he's down with it. AND, he's got a sweet rock in the center of his turf, surrounded by blooming prairie wildflowers. He reminds me of a gangster in a shiny, shark-skin suit (though there have not been any sharks in North Dakota for a few million years). I trust you'll agree this is a beautiful blackbird. But I'll accept rebuttals and counter-nominations. I've spent the past few days leading bird tours as part of The Potholes and Prairie Birding Festival in Carrington, North Dakota. The neat thing about bird watching out here is that everywhere you look, you see birds. Another neat thing is the chance to see east meeting west, like with these kingbirds (eastern kingbird on the left, western kingbird on the right). Among the specialty prairie birds to be found here is the chestnut-collared longspur. 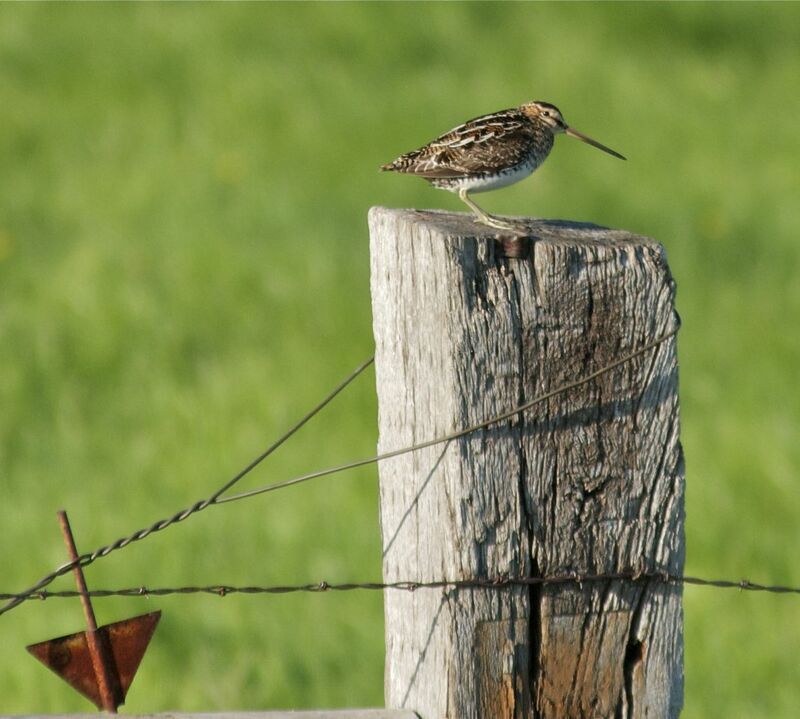 Here's a male on territory in Stutsman County. With all the wetlands, sloughs, wet ditches, and flooded farm fields, there are many chances to see water-loving birds such as this Virginia rail, which came out to see us along Pipestem Creek. 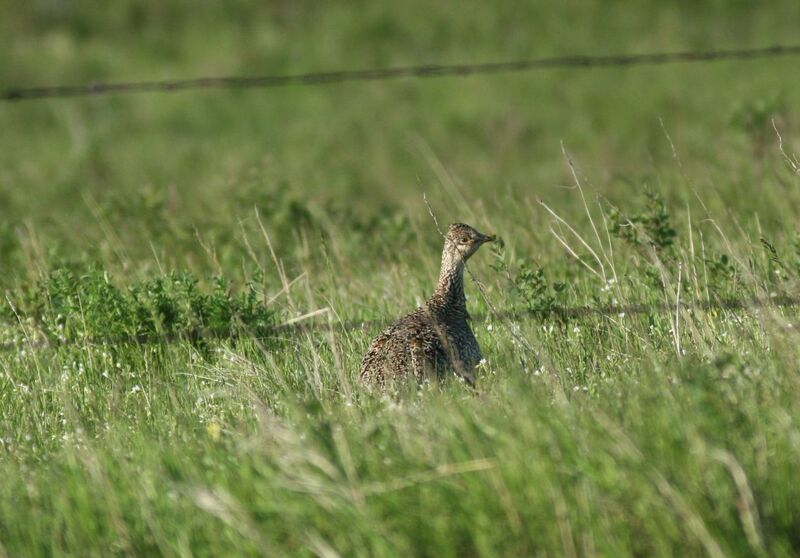 Sharp-tailed grouse are common here but can be tricky to see. We found this one along a fence line while we birded the Jackson Highway. 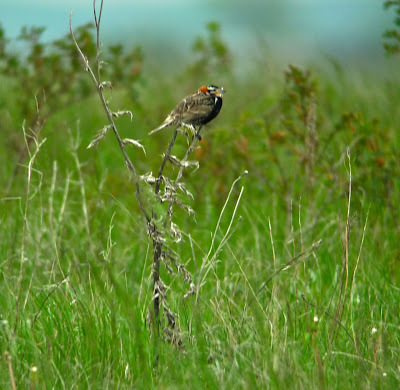 If you've never birded in native prairie habitat, this event offers an excellent way to do just that. Great people, amazing birds, and rolling prairies that go on forever—all the way 'til they meet the sky.